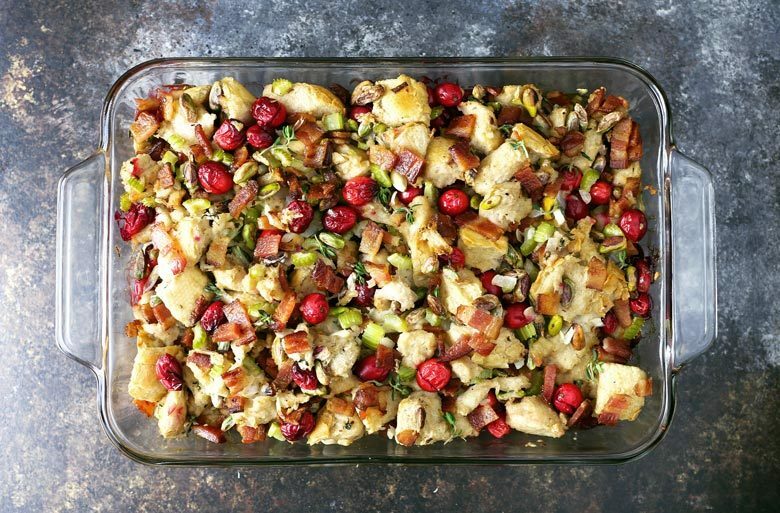 Homemade bacon cranberry pistachio dressing – perfect for Thanksgiving! Whether you put it in the bird (then it’s stuffing) or on the side, no holiday meal is complete without it! Do you see anything different around here? I have a new logo, and a new site design. And I’m soooo excited. I worked with Mariah Althoff on my logo and branding and she is AMAZING. No one has understood my vision quite like she has. Besides the new logo, I changed my theme and it was quite an undertaking. I did the techy stuff myself and it was exciting to learn some new skillz. Yup, skillz. Google is an amazing wealth of information when you start searching CSS and all other code-thingys. Ha, I definitely don’t sound like a computer genius but I’m okay with that because I’m not one. Please take a look at my new recipe index because it’s easier to search for recipes by category. Also, if you want to find a recipe by an ingredient, just type the ingredient in the search box. I’ll be working some more behind the scenes over the next few weeks, making sure all of my photos are nice and large so you can see all of the details of the food. I like to eat with my eyes and I know a lot of you do too. Okay… on to today’s recipe. It’s full of bacon, cause bacon is my favorite and I feel like celebrating. I’m not traditionally a dressing eater but I really like making it. Something about combining my favorite flavors into a bready mess is very exciting. 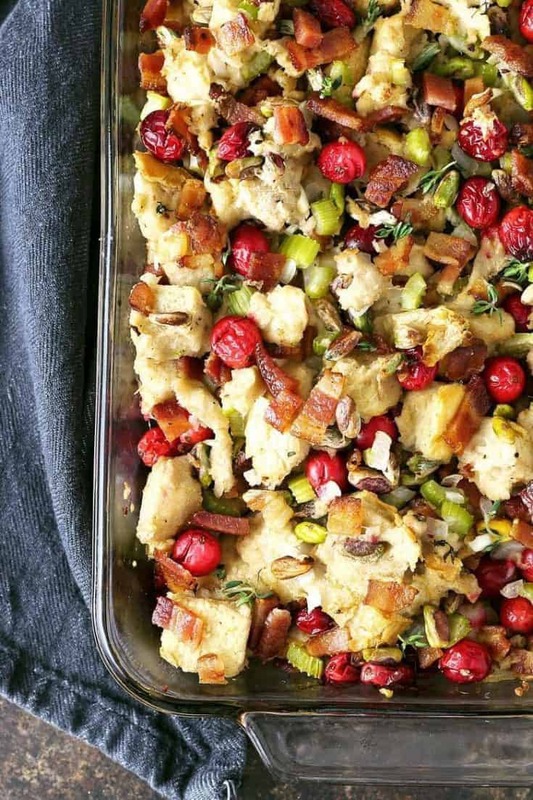 This homemade bacon cranberry pistachio dressing is just that kind of recipe. Bacon is a favorite of the masses. I chose a super thick cut of bacon for this Thanksgiving dressing recipe and sautéed the vegetables in some of the bacon fat. Cranberry has been my favorite flavor this fall season so it had to be included here. I made a delicious apple cranberry mimosa and a cranberry and goat cheese crescent ring earlier this year and still had some fresh cranberries to experiment with. I have never used pistachios in a recipe and was excited to break new-ingredient ground. You need to use unshelled pistachios so either take the time to un-shell a bunch or find unshelled pistachios at the store. I hunted and hunted for them and found some deshelled Turkish pistachios. They are green and purple and added a nice dash of color to this easy recipe. Cut up some slightly stale French bread and place it in a big bowl. Fry up the bacon and remove it from the pan. Pour out most of the bacon grease but make sure there is still a little grease in the pan. Add the celery and onion and once the onion is translucent, add the remaining ingredients. Chop up the bacon into little bits while that is cooking and add it to the bread. Then pour the pan’s ingredients into the bowl and toss gently until everything is combined. Pour into all into a baking dish and bake it in the oven until the top is crispy. 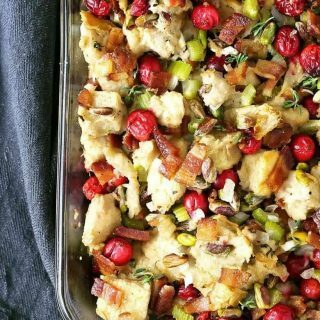 Your guests are going to love this easy Thanksgiving dressing recipe! 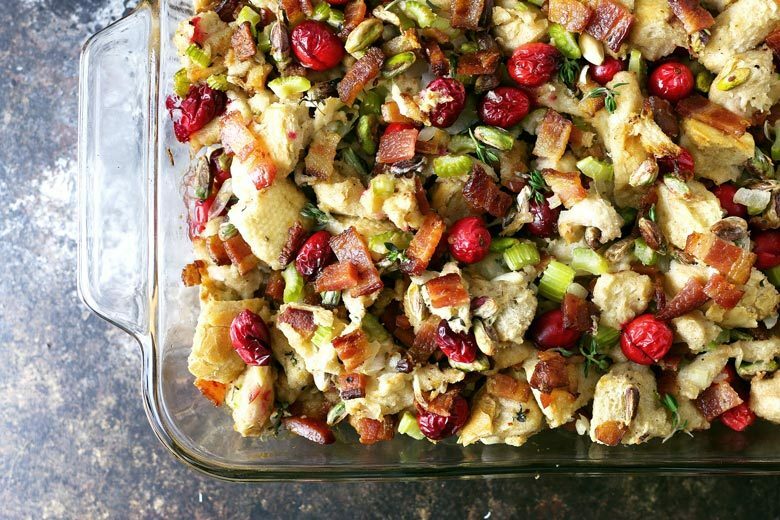 Homemade bacon cranberry pistachio dressing - perfect for Thanksgiving! Whether you put it in the bird (then it's stuffing) or on the side, no holiday meal is complete without it! Pre-heat oven to 350 degrees. Prepare a casserole dish by spraying it with non-stick spray or rubbing it down with butter. Place the bread cubes and cooked bacon into a large bowl and set aside. In a large pan, heat the reserved bacon grease and butter. When the butter is melted, add the celery and onion. Saute until translucent. Add the chicken stock, ranberries, pistachios, thyme, salt and pepper. Stir well, then pour over the bread and bacon. Scrape the bottom of the pan if anything is sticking to it. Pour the mixture into the prepared casserole dish and bake for 40 minutes, uncovered, until the top of the bread cubes are brown and crispy. Halfway through cooking time, stir once. Remove from oven and allow 10 minutes to cool before serving. 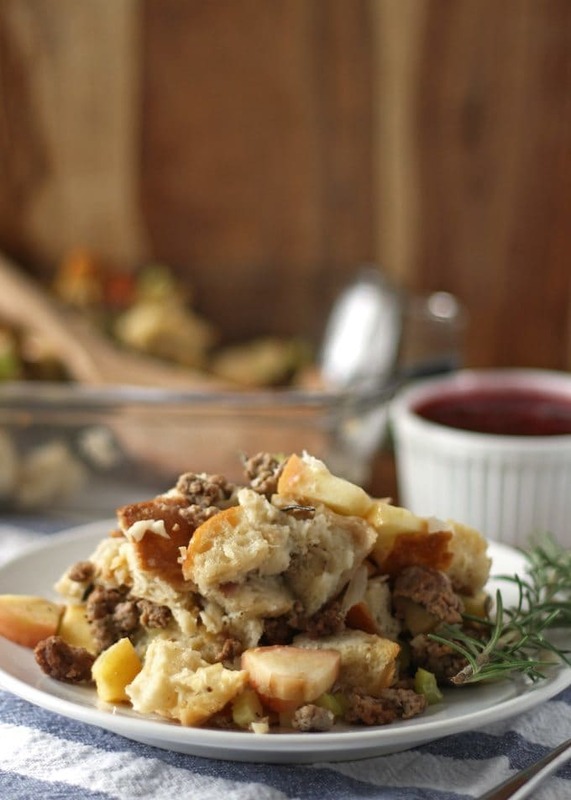 Try this turkey breakfast sausage and apple dressing! 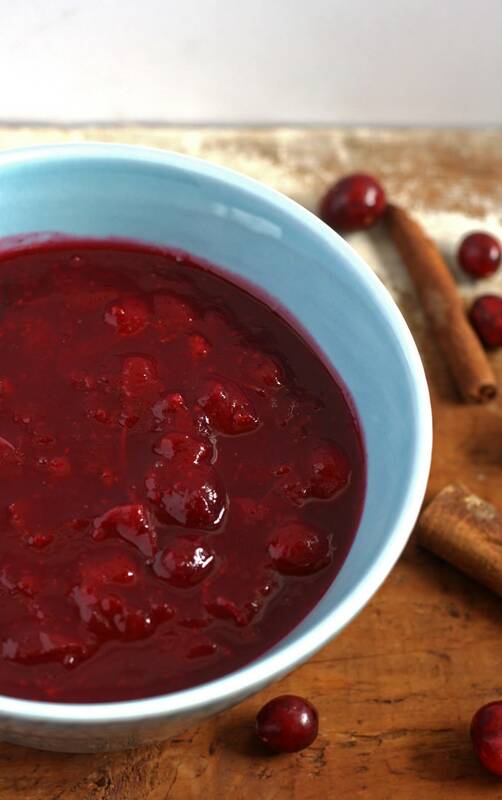 Or this maple bourbon cranberry sauce. This is my kind of stuffing/dressing! I don’t even need the bacon! I’ve been craving stuffing/dressing something fierce for the past couple of weeks…I’m tempted to make only various kinds as sides this year (kidding…but not kidding). 😉 Love the sound of this one, I’ve never had one with fresh cranberries in it before. Your site looks awesome! I love the pistachios in this! And 2 pounds of bacon – yes, please! 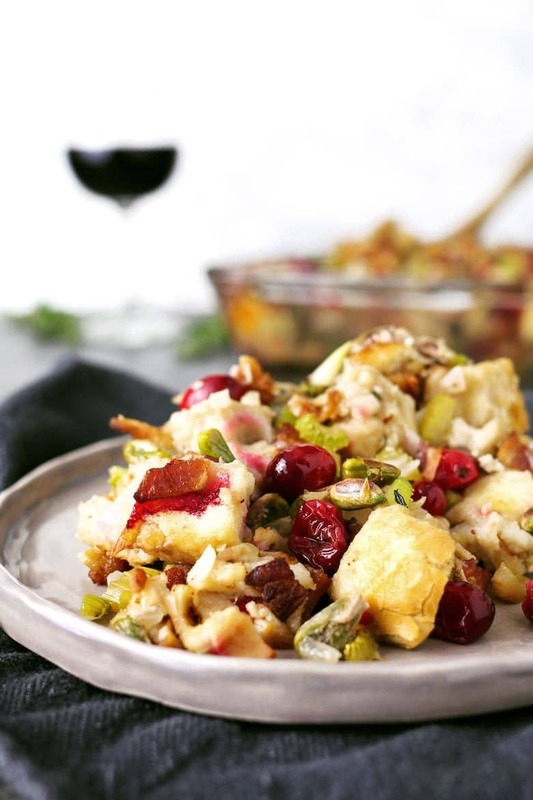 Cranberry and pistachio sound like a great combo! Wow I love how simple and flavorful this is. This is a must make!